And here we are. The ewige werk really is vollendet. The gansey’s been pinned out on its drying boards for the best part of week while Margaret and I took it in turns to keep watch with a shotgun and blast to smithereens any moths which dared approach. Today it was time for the cardification to begin. 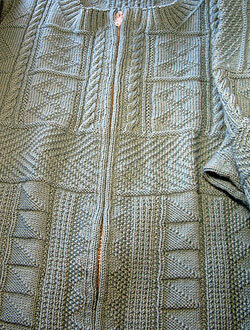 Front detail, on the blocking squares. What’s that ripply pleat thing, you ask? Well if it weren’t there, the front would be larger than the back. So to make the front nicely blocked, the back would have to be overblocked. 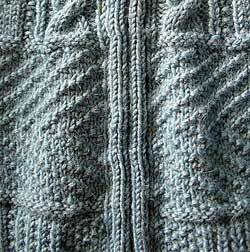 The pleat takes up the excess in the front, making for balanced blocking. 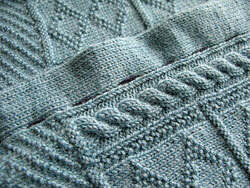 A closeup of the pleat. It was roughly basted with another colour of gansey wool. The Zipper. 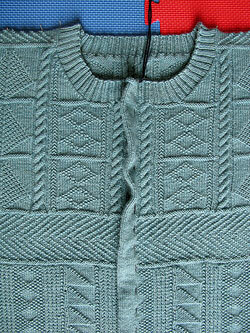 Despite commenters’ good opinions of my perspicacity, I didn’t start looking for a zipper until the gansey was nearly done. Many hours legwork and internet searching later, I found transparent zippers with chunky teeth. Regular dressmaking zippers were too wussy for a jacket, chunky teeth are more appropriate. Unfortunately chunky teeth zippers only come in about 5 colours, none of them remotely like the colour of this gansey. 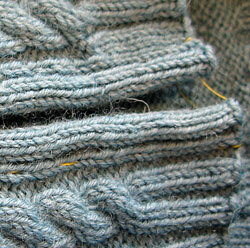 The pleat has been unbasted and the very centre has been marked with pins. The first row of stitching commences. The plan is to stitch two rows then cut between them. Cutting then stitching would probably lead to stretched-out edges. My sewing machine has a fancy pseudo-overlock stitch. 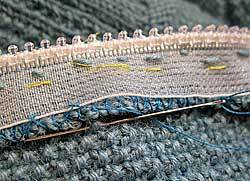 Zigzag or three-stitch zigzag would probably work just as well, or a few rows of fine straight stitching if your machine can’t zigzag. The first row of stitching, to the right of centre. And the second row of stitching. An overall view of the two rows of machine stitching. And a slightly more close-up one. Nearly to the end . . . it wasn’t scary at all. Much. Yes, it really did get totally sliced up the middle. The back of the machine stitching. 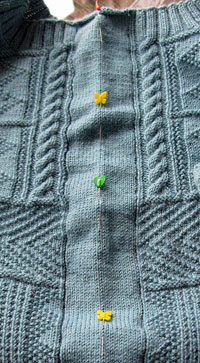 The colour of the bobbin thread doesn’t really matter as it won’t be seen when the zipper installation is finished. The first side folded over and basted down. 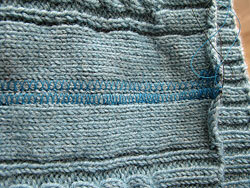 Two stitches from the steek will form the zipper placket, and the rest is folded underneath. 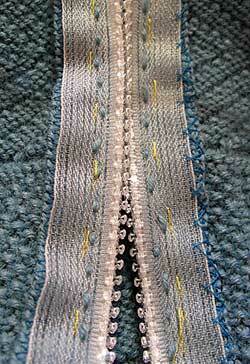 The zipper will be stitched along the column of purl stitches. Now both sides have been folded and basted. I’ve used a doubled length of yellow rayon machine embroidery thread. It’s visible and is smooth for easy removal. It does kink up alot though. The zipper basted in place. The two protruding ends of the zipper tape will be folded and stitched down later. Oops! We cut some of the machine stitching. No worries, I just machine stitched over it again. Everything basted in place. You’d hardly know there was a zipper in there. Sewing the zipper in, by hand. Doing it by machine just didn’t seem right somehow. 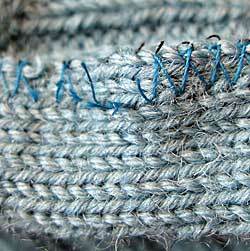 For one thing, hand stitching is more flexible than machine stitching. And machine stitching might leave a more definite seam. 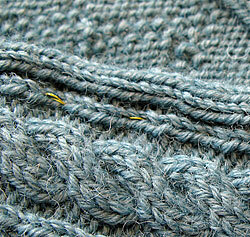 I used a darning needle, a single thickness of the sweater yarn, and a running stitch. 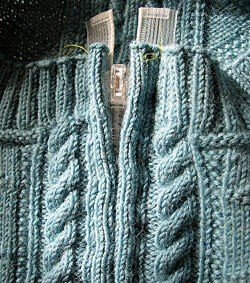 The back side of the zipper showing the stitches. 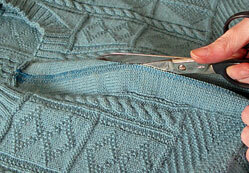 Here I’m securing the zipper tape and seam allowance with herringbone stitches, using a sharp needle and sewing thread. 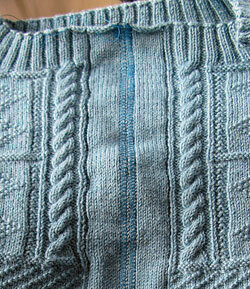 One stitch in the zipper tape, then one stitch in the body of the gansey. Where possible, I’m catching the backs of purl stitches. A shot to show why I’m securing the zipper tape. It’s nice and smooth(-ish) on the right where it’s stitched down, but it’s ripply on the left. The zipper installed. And a close-up view. The zipper pull is a bit naff but I should be able to change it. It’s also plastic so I don’t expect it to last too long. Tools: Sewing machine preferably with zigzag stitch; sewing needle for basting and herringbone stitching; darning needle for installing zipper; scissors (sharp dressmaker’s shears will be easiest). 1. Sew two rows of stitching up the centre. 2. Cut between the two rows of stitching. Yes, you can do it. 3. 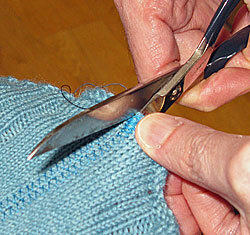 Fold the raw edges under and baste them, using a sharp needle and smooth thread. 4. 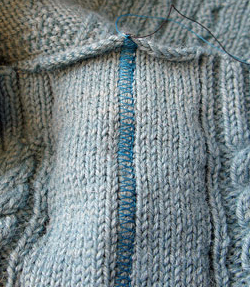 Place the right side of the unzipped zipper face up under the right side of the gansey. 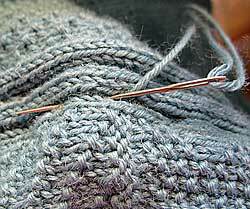 Starting from the bottom up, baste in place, using the sharp needle and smooth thread. The folded edge should be at the centre of the zipper. 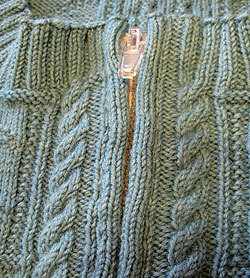 Repeat for the left side of the zipper. 5. 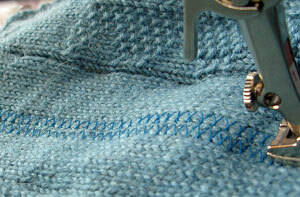 Sew the zipper in place, starting from the bottom up, using the darning needle and gansey yarn. Why from the bottom up? If it’s really crap it’ll be less noticeable at the bottom, and by the time you get to the neck you’ll have had lots of practice. Fold down the protruding ends of the zipper tape and sew them in place. 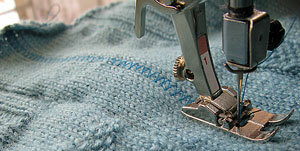 Occasionally run the zipper pull up and down to make sure your stitches aren’t obstructing the teeth. 6. 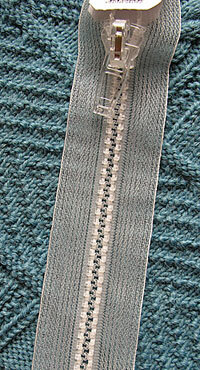 Sew down the zipper tape and gansey seam allowance using a sharp needle, matching thread, and a herringbone stitch. 7. Carefully remove the basting threads. 9. Put your left arm in the left sleeve and your right arm in the right sleeve. 10. Zip up the zipper. Caveat: This is the way I did it – but it doesn’t mean it’s the only way to do it. YMMV. This sweater is gorgeous! Congratulations on a job well done! The pictures are great and very helpful to understanding the process. Let the next sweater begin! I particularly like the added herringbone to secure the edge of the zipper tape. Nice touch. Well done all around, on both the knitting and the zipper installation! Hooray! The whole piece of art is so impressive and stunning! Margaret will certainly wear this with pride. What a great cardigan and an excellent set of instructions. I agree with Suzanne – I want an Action Shot! “Das Werk ist wirklich vollendet”. And thank you for the positive comments. I was of course completely amazed by the complexity of the zipping process – my part in it happily being limited to the initial cutting – and how well it came out. It’s important to emphasise that Margaret had never done this before, so all in all we’re pretty pleased & consider it came out better than we had any right to expect. I can’t promise any modelled shots, but I’ll do my best. More chocolate-coated ginger may required. SongBird – I don’t have a pattern for an evil grin, so it’ll have to be another gansey (honk!). Thoma – how nice to hear from you. My German is mostly restricted to Wagner libretti, and I find few opportunities to slip “Mein ist den Ring!” into every day conversations… Thank you for getting in touch and I hope you will continue to dip into the blog as and when you feel so inclined. It is here summertime,it hasn’t rain for 2 month and the temperature is every day about 20 or more degrees C.
Hi Gordon, i don’t like sunshine, i am very fond of Scotland, i like wind, clouds and even rain.I was a several times on vacation in Scotland, in the neighbour of Handa, Gairloch the Grampians , kinlochbervie etc. I like weather with clouds, a little sunshine and wind much wind and temps so about 20C. Today was the weather rainy and we were very happy. Hear, hear Annalies. Imagine Summer beginning in the middle of May and going all the way through to the first week of October and sometimes beyond. Then imagine 1/2 those days of temps between 95 and 104 and 3/4 those days without a drop of rain. That is most parts of Texas for you. Yeppers, give the rain, clouds, cold any day. Hi Leigh,thank you for your writing, it seems to me like a nightmare, I will never visit Texas :-). Leigh, your part of Texas sounds like my part of Kansas. I enjoy the heat, though–there’s nothing like a 100° day to loosen up a stiff back. 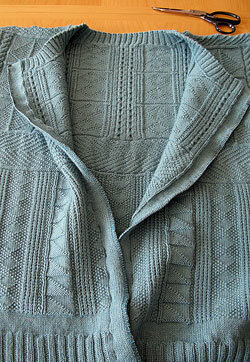 I’m a new reader and am completely in love with this cardigan. Margaret PLEASE please consider posting a photo of you in it. 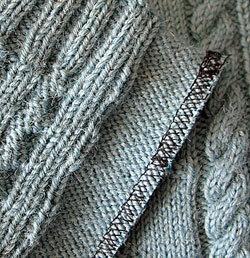 It really makes a difference being able to see knits in action. I’m also dying to know how well they hold up after almost a year. Thanks for posting, and for your kind words! In fact, Margaret was blackmailed into posing for a few reluctant photos in the cardigan – you can see the finished result here, at http://www.ganseys.com/?p=2913. Hope the almost-herniated disk gets better soon!